When you create your account, you will enter your credit card to sign up. Your credit card will be used to fund your CallTrackingMetrics available balance and to pay your monthly plan fee. Your account available balance provides the funds to pay for your numbers, minutes, monthly software fee, and any other premium services (such as transcriptions, premium caller ID, or encrypted call recording) that you choose to turn on. When your balance falls below a specific amount, you can have us automatically recharge your balance using your credit card. For example, you can set your recharge amount to $50, and every time your account falls below $10 we will automatically recharge back up to $50. If your balance falls below zero, your account will be paused. When your account is in this state, online tracking numbers will not dynamically swap ,calls will not be connected, and you will also be in jeopardy of losing your tracking numbers. We will email all account admins with a receipt of the recharge when the account balance has fallen below your desired threshold. We will also send an email when the balance cannot be recharged because of a credit card declining. It’s crucial that the administrator email addresses are correct and are email accounts that are regularly monitored. Unfortunately, we do not have the ability to notify you by paper or phone call when your account is depleted. The best practice is to have a primary credit card and a backup credit card on file. If the primary card ever runs into issues, the backup credit card is your final line of defense to protect your tracking numbers. Estimate how much you expect to spend each month and set your recharge settings so that your balance is not falling below the threshold too often. CallTrackingMetrics bills in US dollars and does not accept Paypal or Diners Club. 1. Go to Settings → Billing Settings. Payment History: Lists your account’s most recent payment history. 1. Navigate to the Payment Methods section and in the Right hand side of that section select the “New Payment Method” button. 2. Add credit card information. 4. Scroll down to “Payment Methods” section and set the new card to be Primary or Backup. Auto Recharge Settings: Here you can configure your account’s auto recharge settings. Adjust your auto-recharge threshold accordingly so your account won’t be charged too often. Payment Methods: Lists all the credit cards for your account. Users who Receive Billing Emails: Lists users’ emails that receive billing statements. 3. Scroll down to “Payment Methods” section and set the new card to be Primary or Backup. 2. Under the Payment History, you will see an eyeball next to each charge. When you click on that you will get a new window of your receipt that you can print off . 3. Next to each credit card charge, click the Receipt Link to open a receipt and print. Administrators will also receive an email receipt each time the card is charged. Should the card fail, you can click on the “failed” message to see the reason why the transaction failed. Statements will show all credit card charges as well as the usage that was applied to the available balance across a given date range. 2. 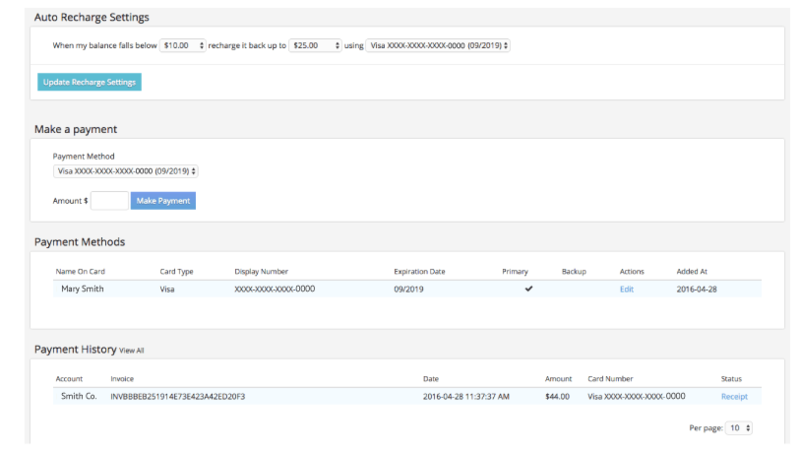 In the Billing Settings page, go to Payment History section. From there on the right hand side is a button that says “Printable Statements.” Once you click on printable statements you will get a pop-up prompt. 3. In the pop-up, select the Date Range for your billing statement. 4. Select the email address you’d like to send the statement to. 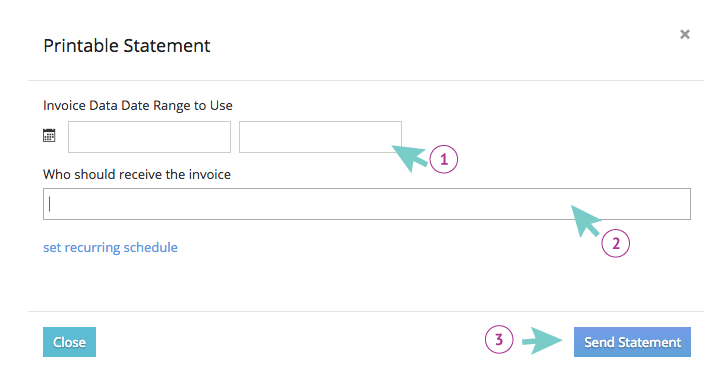 In the pop-up box, click “recurring schedule” to have these invoices emailed to you on a regular basis.